Slow Dakota (born PJ Sauerteig) started releasing music from his Columbia University dorm room in 2012. (Soon after, he founded Massif Records to release his music and the music of close friends). Sauerteig's music weaves between folk, baroque pop, classical, indie rock, and electronic. Nominated for a Pushcart Prize in 2016, Sauerteig is also known for his vivid lyrics, which fixate on myth, fairy tale, and rural folklore. 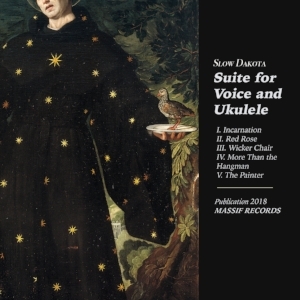 With his latest Suite for Voice and Ukulele, Slow Dakota pushes even further into folk territory - with clarinet, flute, and organ arrangements that recall the classical training of his childhood in Indiana. Produced by Sahil Ansari and mastered by the legendary Greg Calbi (David Bowie, The National), Slow Dakota's new Suite is his most accessible work to date - richly layered but inviting, sweet and moving. Sauerteig is an extremely reclusive musician - he's never toured, and has only ever played a handful of live shows. (Perhaps explained by his having spent the last three earning a graduate degree from NYU Law).